For this month's International Food challenge as we are exploring Australian cuisine. This cuisine is strongly influenced by culinary tastes of British and Irish traditions and immigrant settlers. Agriculture is a significant part of the country's economy and so fresh produce is available in abundance. 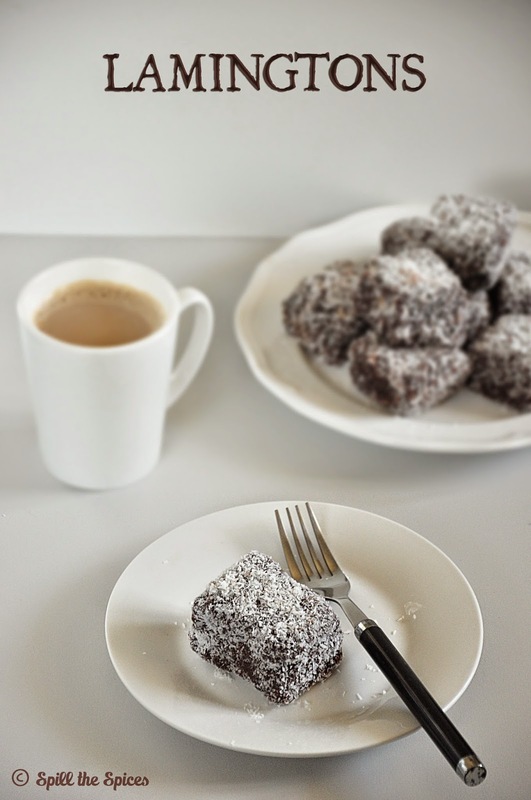 This month's host Saraswathi of Sara's Kitchen has chosen some iconic Australian food like Anzac biscuits, lamingtons and damper, and I made lamingtons for the challenge. Lamingtons are believed to be originated from Australia and there are many interesting stories behind the origin of this cake. Lamingtons are considered the national cake of Australia. A lamington is made of sponge cake pieces coated in a layer of chocolate icing and rolled in desiccated coconut. Lamingtons can also be split and filled with jam and cream in the center. Serve these lamingtons with tea or coffee! 1. Preheat the oven to 180°C | 400°F. Grease a 20cm x 30cm pan and line with baking paper. 2. Sift the all-purpose flour, cornflour and baking powder together three times. Set aside. 3. In a large mixing bowl, add the eggs and beat them with an electric mixer until pale in color. 4. Gradually add the sugar and beat until the mixture becomes thick and forms thick ribbons when the beater is lifted. 5. Add vanilla and beat for few seconds. Then add flour mixture and gently fold using a spatula or metal spoon. 6. Combine butter and boiling water in a small heatproof bowl. Fold this gently into the prepared batter. 7. Pour the mixture into the prepared pan. Bake for about 20-25 minutes or until sponge springs back when touched lightly in the center. Cool the cake completely. 8. Cut the sides from the cake and then cut them into square or rectangle pieces. 1. Sift the icing sugar and cocoa into a large heatproof bowl. Then add the butter and milk. Place this over a saucepan of simmering water. 2. Mix until icing is smooth and thick enough to coat the back of a spoon. Place desiccated coconut in a shallow bowl. 3. Using 2 forks, dip each cake piece in the icing. Tap the forks on the edge of the bowl to remove excess icing. 4. Roll the cake gently in coconut. Transfer to a wire rack and allow to set. The cake is easier to handle if it is made a day ahead or refrigerated for several hours. You can also freeze them for 1-2 hours. Folding the flour and butter gently is important for a soft sponge cake. If you mix a lot, the cake will turn out hard and dense. If the icing becomes too thick, place it over simmering water or reheat gently with a little more milk. Perfect Lamingtons.. Love to grab some from my laptop scream.. So inviting dear.. Please link your entry to below address dear..
Those are some delicious and tempting lamingtons! this is one WOW dish you had it, looks super delicious. wow! 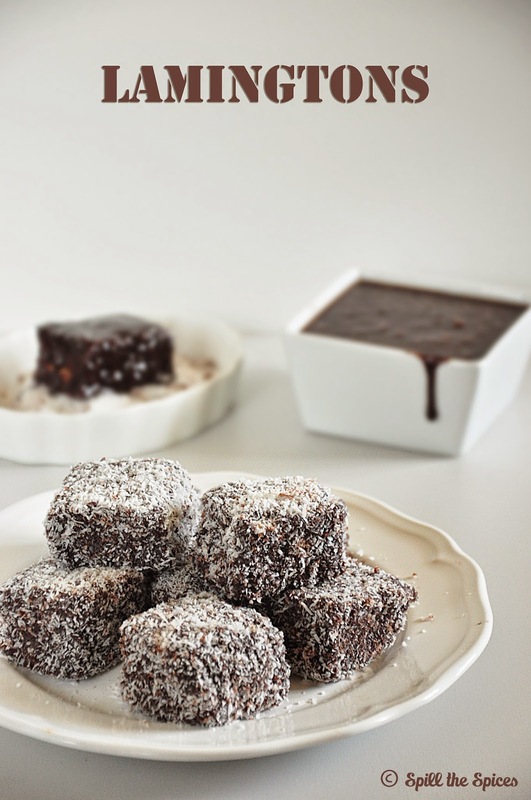 these lamingtons looks so perfect and beautifully pictured..
lamingtons looks perfect and tempting. These lamingtons looks fabulous.. beautiful clicks.. Perfectly made lamingtons, looks delicious! They look super awesome Sona..Send some of those to me...As always, perfect click..
Lamingtions look so tempting.. Lovely pic dear. 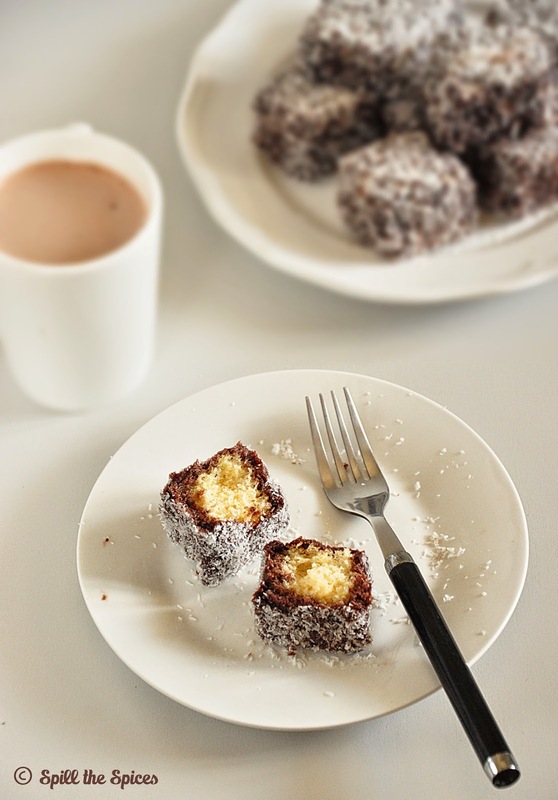 beautifully made lamingtons.. and lovely pics..
Lovely lamingtons.. the small bite size cubes are so cute. I haven't tried an eggless version. You can use an eggless sponge cake recipe instead and follow the remaining recipe.